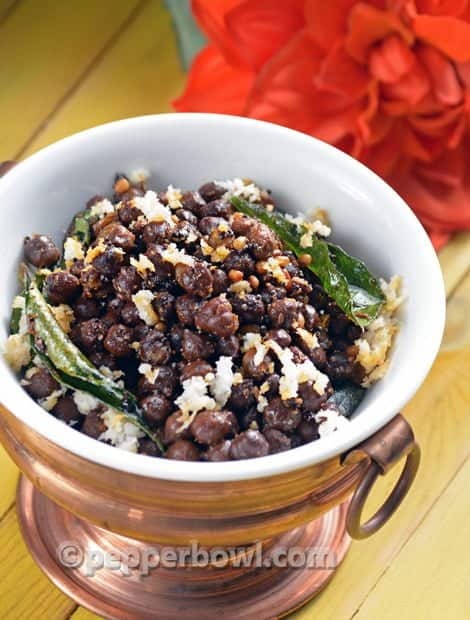 Navratri or Viniyagar Chathurthi is incomplete without this Kondakadalai Kara Sundal. Rather than it is a festive recipe, it also a very healthy snack. The sambar powder is the magical ingredient in this recipe. It boosts the flavor and adds an extra dimension to the dish. For healthy freaks, you must know it already as this protein rich recipe is the best snack to munch on. I have seen my brothers were gulping it for the breakfast on their adolescent age. In southern India, joining the gym and having kondakadalai sundal for the breakfast is a common routine when a boy turns into an adult man. The sambar powder is the magical ingredient in this recipe. It boost the flavor, and adds an extra dimension to the dish. Another festive recipe that can pair up with this kondaikadalai Sundal is Modagam and Poorna Kozhukkattai. 1. Soak chickpea for 8 hours, overnight soaking works fine. Wash and drain. Add salt and pressure cooks it until it becomes soft and not mushy. I usually cook in high flame till 1 whistle and then in simmer flame till the second whistle. 2. Heat cooking oil in the pan, add mustard seeds, urad dal, asafoetida and curry leaves. And wait till mustard gets splutter. 3. Add cooked and drained chickpea with a tsp of sambar powder and saute for 2 minutes. Add grated coconut and serve. If you wish to keep the sundal for longer times, then saute the grated coconut for another couple of minutes. Kondakadalai Kara Sundal. Rather than it is a festive recipe, it also a very healthy snack. The sambar powder is the magical ingredient in this recipe. It boosts the flavor and adds an extra dimension to the dish. Soak chickpea for 8 hours, overnight soaking works fine. Wash and drain. Add salt and pressure cooks it until it becomes soft and not mushy. I usually cook in high flame till 1 whistle and then in simmer flame till the second whistle. Heat cooking oil in the pan, add mustard seeds, urad dal, asafoetida and curry leaves. And wait till mustard gets splutter. Add cooked and drained chickpea with a tsp of sambar powder and saute for 2 minutes. Serve as a snack in the evening for the growing kids. Medhu Vadas are the best combo. If the kiddos do not prefer spiciness, avoid adding sambar powder and substitute with coriander powder. Tim, white colored variety is available in all most all leading stores including walmart. 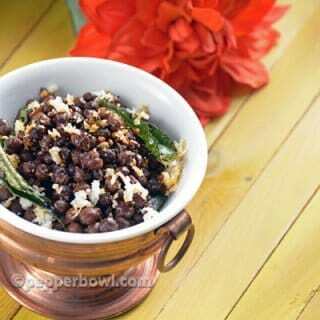 The black chickpea variety referred in this recipe, available in amazon.com and in all Indian stores. White colored chickpea can also be substituted here in this recipe. 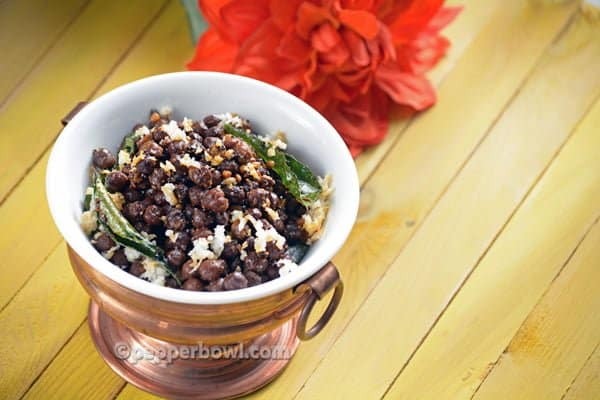 Super healthy sundal, I love the bowl Suja…. like the addition of sambar powder.. a healthy sundal..